Three is the magic number. Three is lucky. Three's a crowd. Okay, ignore that last one, but the number 3 does also apply to the latest Galaxy Note, and we're curious to know which of those maxims might apply. What are the marquee features this time around? Well, there's the usual bevy of specification improvements (a 5.7-inch display, quad-core Snapdragon 800 and 3GB of RAM), Android 4.3, some new S Pen features and the small matter of the Gear, that optional, polarizing companion watch. 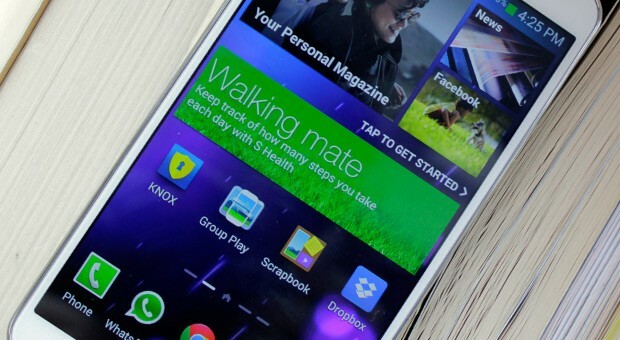 Samsung makes a great many products, even if you just consider the mobile ones. However, since it burst into existence in 2011, the Note has been up there with the Galaxy S series on the flagship pedestal. So, it'd be fair to say that we're expecting big things from this big phone, but with a SIM-free price in the UK of £620, it requires even deeper pockets than its predecessor did at launch (that one cost around £530). That said, if you want one, you'll need big pockets anyway. While you check their size, we've scribbled, doodled and gestured the Note 3 with abandon to see if it's worth the bounty. Read on to find out if it is. 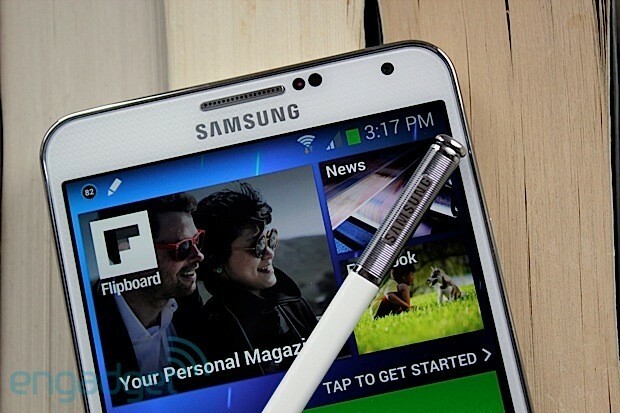 How would you rate the Galaxy Note 3? We know the drill, and we know that you know it too. The Galaxy Note 3 is a large phone that offers a similar experience to a small tablet (we're avoiding that word); its particular party trick being the now-familiar S Pen. As for aesthetics, we once again find ourselves on well-trodden ground, as Samsung largely opted for minor tweaks this time around. That said, in a lineup, the Note 3 probably shares more of a family resemblance with the original than the Note II, thanks to its much straighter lines. In a way, this also follows the evolution of the Galaxy S 4, which was ever-so-slightly less curvaceous than the phone it deposed. One thing's for sure: you can't accuse Samsung of being inconsistent. If we get out the measuring tape, we'd see that it's 5.95 inches (151.2mm) tall, 3.1 inches (79.2mm) wide and 0.33 inch (8.3 mm) deep. Number fans will be quick to note that despite the larger display (5.7 inches, up from 5.5), the Note 3's footprint has remained largely unchanged. In fact, it's a hair thinner and narrower, and only 0.1mm longer. This design voodoo doesn't end there, as the phone has even shed a fraction of an ounce, dropping from 6.35 oz. (180g) to 5.93 (168g). While the overall appearance might be little more than a gentle massage of a tried-and-true formula, there are a few differences that are worth mentioning. We'll start with the edges, which, sadly, continue to have that faux-metal finish. This is a real shame. We firmly believe that upgrading to an actual metallic band (at least across the premium Galaxy models) would give them a much more premium feel. At the very least, it'd spare a lot of disappointed sighs from people after picking up these devices for the first time. Material issues aside, as we mentioned in our preview, the edges of the phone are ridged, a design inspired by the pages of a book. While the effect isn't unpleasant, and does add some grip, we're not convinced by the marketing spin. On the top-right corner of this outer band, you'll find the power / standby button. Given the size of this phone, it likely won't sit in a comfortable spot for everyone. If you instinctively pick your mobile up from the bottom section (so it sits at the base of your palm), then only those with larger hands, or lengthy fingers, will be able to reach it easily. Remember, though: this is nearly a 6-inch device. It comes with the territory. Flip it over, and along the bottom edge you'll find the enclosure for the S Pen (more on this later), the speaker, mic and micro-USB 3.0 port. This last item is one of the notable differences, as you won't see it on too many phones right now. If you've not seen one before, imagine the micro-USB port on most smartphones, with a smaller, sister port joined on; then you'll get the picture. The first thing many will likely think when they see it is, "Will I have to get a bunch of new cables?" And the good news is that the answer, for the vast majority of people, is: no, you won't. You can actually plug in a micro-USB 2.0 cable into the new port, and your phone will charge just fine. The same goes for MHL; this can also handle legacy cables. The benefit of the newer connector is that it improves the effective / usable data rate from around 280 Mbps to 4 Gbps. Good news if you like to move big chunks of data around this way, but we're not sure if the benefit offsets the somewhat uglier connection. If you keep going around the edge, you'll meet the volume rocker just where -- Samsung users at least -- might expect. Finally, up top you have your 3.5mm jack and IR blaster, just like on the GS4. 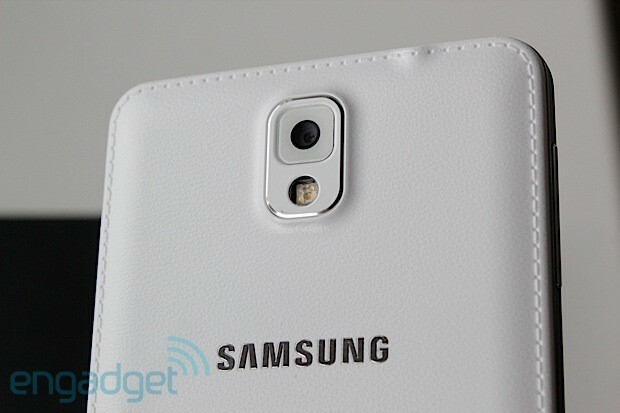 Another notable change is the textured "leather-like" back, complete with faux stitching. The great news is that this feels much, much nicer than the glossy, slippy-slidey back panels of most recent Samsung phones. We're not entirely convinced of the need to go as far as pretending to have stitches, though: it's clearly just a polycarbonate cover. You can insert your own comment about Apple recently dropping all that skeumorphism from iOS... here. At the very least, there's no danger of being accused of copying. The important takeaway here is that it feels a lot better than other Galaxies of late. Give us a real leather back, and that metal trim, and we can die happy. Pop that new back panel off, and you'll see an outline of where the S Pen lives, the 3,200mAh battery (a boost from the Note II's 3,100mAh cell), NFC and wireless charging contacts, and the microSD / microSIM slot. The latter two sit right atop each other, which is easy to miss at first glance. If you've not seen this before, on first inspection you can spend a few moments looking for the memory card holder, until spotting it, right there in plain sight. If you're curious, by the way, that microSD slot supports cards as large as 64GB. And, of course, amid all this is the main camera, which gets a resolution bump from eight to 13 megapixels (the front-facing one is 2MP). The handset we have for review here is the European LTE version (SM-N9005), which includes (800 / 850 / 900 / 1800 / 2100 / 2600) on bands 1, 3, 5, 7 and 20. As for HSPA+, there's support for (850 / 900 / 1900 / 2100). As is the norm for this region, of the two CPU variants available (Qualcomm or Exynos), this model comes with the quad-core Snapdragon 800, clocking in at a tasty 2.3GHz. To complete the spread of important numbers, there's 3GB of RAM, options for 32GB or 64GB of internal storage, and all the radios you can shake a stick at (Bluetooth 4.0, 802.11a/ac/b/g/n, GPS, GLONASS, DLNA and that NFC chip). When you've got a screen this large (5.7 inches, in case you forgot), it only seems fair to give it some of its own airtime. The good news is that the resolution has been increased to complement the extra real estate. This is a 1,920 x 1,080 "FHD sAMOLED" panel, if you go by Samsung's nomenclature, but essentially, it's a full HD Super AMOLED screen. This equates to a pixel density of 386 ppi, if you're counting, and that's a marked improvement over the OG Note (285 ppi) and Note II (267 ppi). Much more importantly, it looks great. Colors are bright and vibrant and those equally important blacks are nice and dark as you'd hope. Sometimes it can be a little too saturated, if anything, like when using the camera viewfinder. Brightness and contrast really make images pop, and the viewing angles are wide -- great for video. With so much space, viewing photos and video is a step up from what you may be used to with "smaller" phones -- these days, anything less than 4.3 inches. As for the great outdoors, (when you're clocking up your S Health stats, naturally) the screen remains clearly visible, even without jacking up the brightness to extreme levels. Though, of course, this depends on a number of factors: how bright it is where you are, the angle of the sun, et cetera. What makes the Note series unique isn't just the form factor; it's the inclusion of the S Pen. 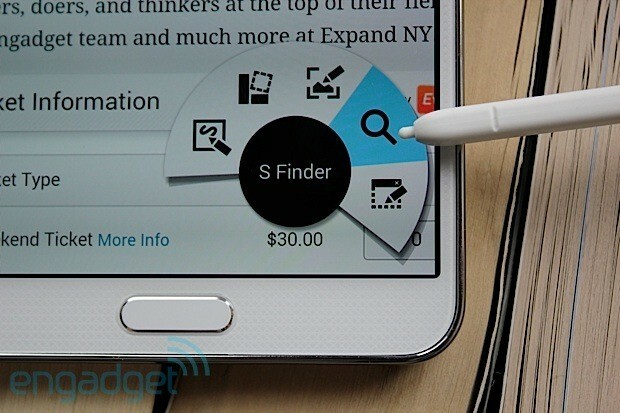 Accordingly, the Note 3 also gets some new software features to make use of that pen accessory. While we're definitely looking at Android (Jelly Bean 4.3), it's still hidden under TouchWiz, a UI that Samsung has a habit of peppering with its own software. The most well-known examples of this are all the "S" apps -- S Voice, S Planner and the like. These, as you might expect, are all present and correct, with no noticeable core differences from previous iterations. Other familiar faces include S Health, Samsung Hub, Samsung Link and ChatON. There's also a new addition called "My Magazine." There are a couple of updates to the S Pen-specific apps, too, which we'll cover later. Since it's new, let's start with that My Magazine app. Essentially it's a partnership with Flipboard that brings the glossy social / news feed you may be familiar with to a dedicated Samsung app. To access it, simply swipe up from the bottom of the screen, or press the home key when on the home screen (an option you can disable). The first time you open it, you'll be met with a polished-looking video splash screen, and then a very quick setup. As you might expect, you can choose to receive news from a comprehensive selection of categories such as business, design, movies, sports and technology. Likewise, you can add your social feeds from the usual, and less usual (500px, Sina Weibo) suspects, with Facebook being a glaring omission. The last channel you can include in your feed is "Personal," which weaves photos, notes, videos, calendar entries and even email into the magazine mix. The interface itself is clearly very similar to Flipboard, BlinkFeed and many other modern feed-style apps. It does look really good on the Note's display, and the slick animations as you swipe between pages are suitably satisfying. While this is arguably just another widget / app, the fact that Samsung's included a shortcut menu on the top right that gives direct access to core apps like camera, dialer, browser and even the app tray possibly indicates that it's hoping you'll spend a lot of your time here, perhaps even opting for it as your standard home location. If you were a fan of all those fancy gesture and eye-tracking features introduced to the Galaxy line over the last year or so, then you'll be glad to know that they've found their way over to the Note 3. 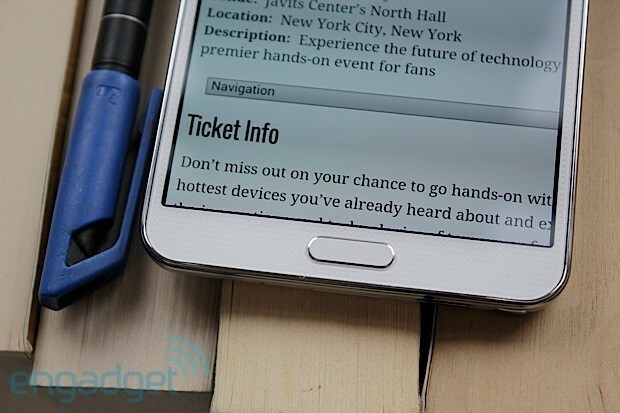 Also on board: Reading Mode, which we saw on the Note 8.0. Other stalwart features you'll find here are Popup video and Multi Window multitasking. 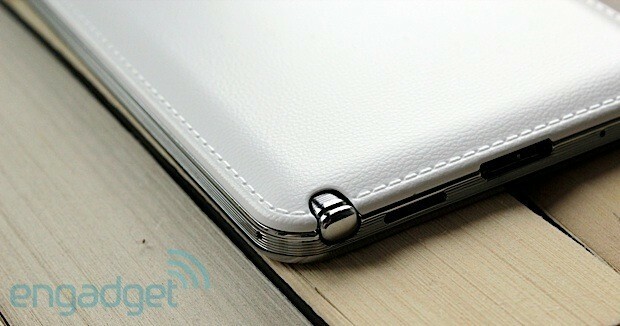 The latter we also saw on the Note II, though this time it comes with a few improvements. If you always use the same pair of apps -- say a browser and YouTube, you can create a "paired window," to save you having to go through the process each time. Also, this time around, they can both be the same app. The last new feature is the ability to drag and drop content (namely a screen shot, or text) between the two. It works OK, but some apps aren't compatible, by which point you might have done it a quicker way. While we're still big fans of Multi Window, you can sometimes find yourself accidentally tapping the back button when trying to do something else on the lower of the two screens, thus breaking your workflow, or closing the app. That's unless you opt for a two-handed approach, anyway. Which reminds us, there's also a one-handed mode you can take advantage of. Activate this, and whatever's on screen shrinks to a smaller window; the idea being that it's easier to access with only one paw. The good news is that it now works for all screens / windows; the bad news is that the gestures to activate and deactivate it on the fly can be a bit fiddly, or ironically, require the use of both hands. It's clear that Samsung is building upon its own software additions, and growing them over time, which will either tickle or taunt you, depending on your preference for custom software. But, for those that think it's all add, add, add, not everything makes the cut. Not in Note-land, anyway. If you were a fan of Quick command on the Note II, sadly it is no more -- and this of course includes all of its associated gestures. On the plus side, there is a new option to (sort of) fill its space, and that's Air Command. Despite sounding like a straight-to-DVD Van Damme movie, it's actually more useful than that. Samsung has made the assumption that if you're removing the S Pen, then you're likely about to do something with it -- which makes sense. As such, once unsheathed, on screen you'll get a circular pop-up. Within that are five options: Action Memo, Scrap Booker, Screen Write, S Finder and Pen Window. You can also access this same menu if you've already extracted the pen, by long-pressing the S Pen button while hovering over the screen. This behavior is configurable, albeit only with a choice of two other options: to open Action Memo instead, or to do nothing. The default behavior when just pressing the S Pen button, and drawing on screen, however, is to create a marquee / selection of whatever you draw around, and quickly drop it into one of many apps that pop up in a tray below. These include Scrapbook, Evernote, Gmail and Hangouts. Possibly the simplest, most useful part of the S Pen experience. So, you're probably wondering what the apps on Air Command menu actually do. Well, Action Memo seems to be a repurposing of the old S Note mini-widget we've seen before, but with one key difference. Scribble on the pad, click "link to action" and it will select your doodle, placing a menu underneath of predetermined actions to apply to it. An obvious example being that you can draw out a phone number, email, web address or physical address, and Action Memo will recognize what you've written, and pipe it into the corresponding app. Essentially, it's just another way to get thoughts, names and numbers down from screen to contact book / browser and so on. Scrap Booker, on the other hand, is much simpler. If you're browsing the web and see something you like, or an image in an app, activate Scrap Booker, draw around it and it'll be saved into your personal -- you guessed it -- scrapbook. You can add memos and tags to images, plus organize them into different books / categories, making it very much like a lightweight Evernote alternative. 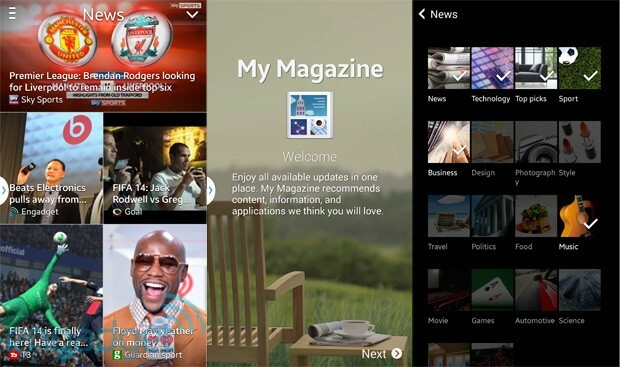 All your clippings can then be viewed on other devices with the Samsung viewer app. Screen Write is similar, but much simpler. Choose this option, and the phone takes a screen grab, and opens it up in a simple editor. Here, you can write notes and messages on top of the image, crop it down to a particular section and then share the result. Going for ramen with a friend, but know a good shortcut? Use Screen Write to circle that route on a map and send it right over. The trend for self-explanatory names continues with S Finder, which is a newish take on the regular "spotlight" style local search you find in OS X. Using either the S Pen, or regular input, you can search for notes, email, pictures or the web, plus any local media you've tagged. There's some level of usefulness here as you can filter to browse anything that you've ever made a note on, or search specifically what you might have written. So if you jotted a joke, but two weeks later you forgot the punchline, you can enter in a word or two of the opener, and it should find it. The handwriting recognition obviously plays a big part here, but we've had no major issues with it that couldn't be attributed to our own lazy writing style. Last up is Pen Window. Again, really simple stuff: draw a rectangle, and a menu of compatible apps (YouTube, Calculator, Browser, et cetera) appears inside. Choose one, and it opens in the window you drew. This is effectively another way to multitask, and it's an easy way to have a floating app window, or two, or more. These can be minimized and reopened, moved about and expanded back to full screen. Sometimes -- depending on the dimensions of the square you drew -- the UI of the app inside can look a little stretched. But it is kinda handy if you're working on something and you want to open up a calculator on screen, and keep it there as you go, or open a YouTube window in the dimensions of your choosing. There are a few other perks when using the S Pen, such as with Air View to preview items in the Gallery (for example). When hovering above an image, the on-screen pointer throbs blue to let you know that there's a contextual menu. When you see this, you can click the button on the S Pen, and it'll show up, in this case offering photo frame, crop, edit and share options. Likewise, double-tapping with the pen and the button pushed will drop you straight into Action Memo, while a long-press on the screen with the button held will take a screen grab. We know we just spent a good deal of time talking about the Note 3's companion pen, but a closer look at the hardware is in order too. Most importantly, there's the small matter of its behavior with the phone's capacitive buttons. Until now, tapping the S Pen on the back or menu key of the two prequel Notes was an exercise in futility. Not anymore. 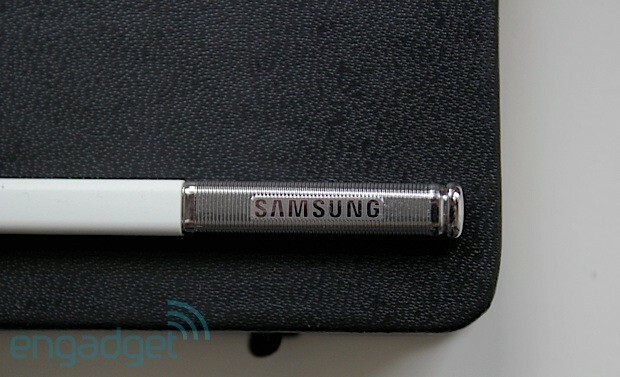 Yes, Note fans, you can finally use the S Pen on the capacitive buttons. You'll still have to physically depress the home button, but, hey, this is definitely progress. As for the pen itself, there are some subtle differences in the external appearance, especially in the silver section up top. It's still plastic, but instead of a brushed-metal look, it's faux-ridged metal. This at least makes it match those faux book lines. The size and button are very similar to the Note II's pen, as is the position of its housing on the phone (bottom-right corner). We commented in our preview that it felt a little tough to tug at when trying to remove it. This is still true. Perhaps at the very least, you'll stop worrying about it dropping out after spending a few months with the phone. That said, despite the seemingly snug fit, there is a little jiggle space if you place the tip of your finger on the end and move it back and forth in place. Wardrobe and waist measurements aside, the S Pen also remains similar to its predecessor in actual use, which we're not complaining about too much, as it does its job just fine. If you ask enough people, you'll soon discover a number of them that almost put the S Pen in the same category as things like Air Gestures; a nice idea, but something you won't use once the novelty wears off. That may be true for some, but we can definitely see there's a slice of the market that appreciates the option, and while Samsung continues to offer it to us, we can all live along happily together. One other hotly anticipated (and controversial) announcement at this year's IFA was of course the Galaxy Gear smartwatch. We'll very soon be publishing a separate review of the Gear, but we've already had the chance to spend some time with it, and in conjunction with the Note 3 -- one of only two devices currently compatible. Setting it up is easy. The watch's charging cradle contains an NFC tag; just tap it with the Note, and it automatically downloads the app, installs it and pairs the two devices together. It even sets the time on the watch. 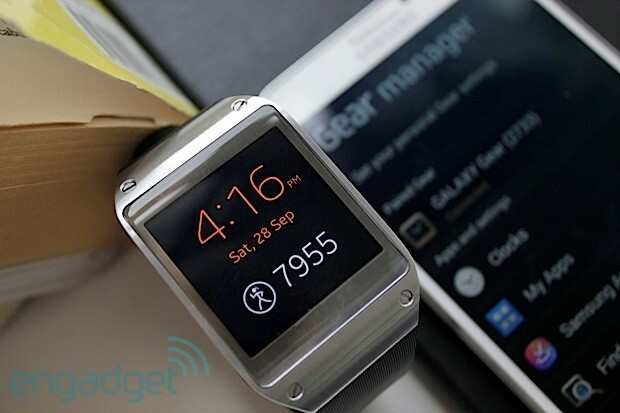 The companion app makes it easy to interact with the Galaxy Gear. The first thing you'll want to do is choose the clock screen from a choice of analog-style faces, to digital clocks with app shortcuts, etc. Then you can dive into the settings, where you can set the phone to auto lock when out of range of the watch (i.e., require a passcode), choose notifications and assign what app opens on a double-press of the Gear's button. After you've set things just how you like them, you can browse the available apps for the smartwatch and install them directly via the companion app. If you're imagining that there's not much available, you'd be largely right -- but there's still more than we expected. Even a couple of big names, such as Line, Pinterest, Pocket and Evernote are present. That last one gives an idea of how the two devices really can work together. With Evernote installed on the watch, you can take a photo and have it automatically uploaded to your account on the cloud. Great for snapping that special something you saw in a shop, or that quirky graffito in the street without looking too conspicuous, or having to get your phone out. Without a doubt, one of the most obvious functions is notifications, but currently this is a bit of a mixed bag. Gmail's notifications, for example, are nothing more than a pop-up alert that informs you that you've received a message -- that's it. Not much benefit there compared to an alert sound or vibration. You can tell the watch to open the email on your phone, but you'll still need to head back into your pocket to see it anyway. We're hoping that this may improve in time once developers have more time with the device. Surprisingly, or not, depending on your point of view, TouchWiz's native Mail client notifications let you see the sender instantly, and then read the whole email if you wish, right from the watch. We're not sure of the long-term usefulness just yet, but we did feel a little bit smug reading an email in one room, having left the handset in another. Likewise, when calling someone directly from Gear, and speaking to your wrist Inspector Gadget-style. It worked pretty well, but we're not sure we'll be doing it much outdoors / in public. It's hard to determine the effect on battery life caused by pairing the two without more extensive testing, but our battery monitor app suggested a slight percentage rise in drain; again, we'll have more detail on the review. That's only scratching the -- figurative -- surface, but on first impressions, the two work well together. Whether the watch or the app support is ultimately for you might be a different question altogether. 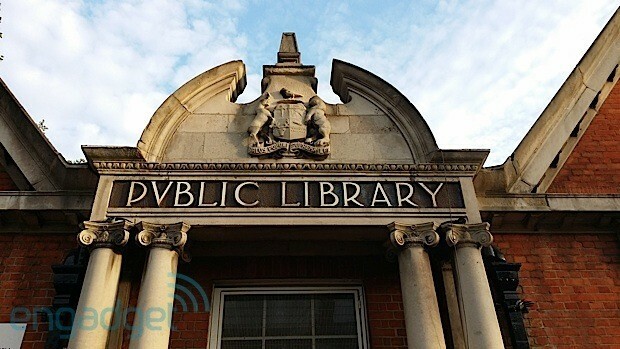 Fancy yourself as a bit of a picture buff, do you? Well if you headed here first, maybe you are. The big number you're likely interested is 13. That's the megapixel count for the main shooter (it's just 2MP on the other side). On the software side of things, there are a couple of differences to what you might have seen in other recent Samsung devices like the Galaxy S 4. For starters, Night mode has disappeared, leaving only "Smart Stabilization," for low-light situations -- which looks remarkably similar to the GS4's auto night-detection option anyway. All of the other camera modes from before are present, such as Best Face, Eraser, Sound and Shot plus two more new ones -- Golf and Surround Shot. The former might sound somewhat specific -- a whole mode for golf photos -- and that's because it is. 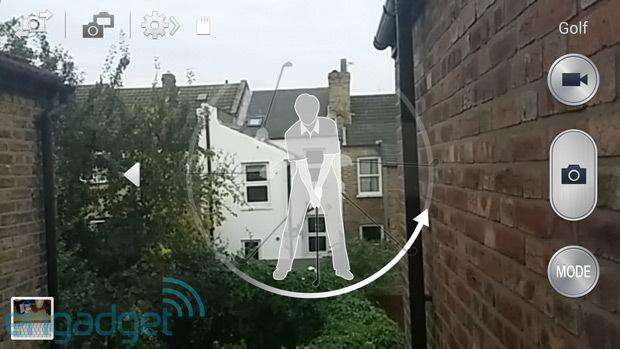 Choosing this option (available in landscape only) overlays a semi-opaque image of a golfer surrounded by a circle. The idea there is to frame your subject within this, and the camera will auto-detect the swing. Once complete, you'll have a series of photos that you can scrub through, back and forth, to analyze your form. Or mock your friend, depending on how good you are. The other new option, Surround Shot, will likely have broader appeal -- especially as you may also know it as Photo Sphere. If you've ever used this before, you'll know that it's a way to make your own Street View-style shots. 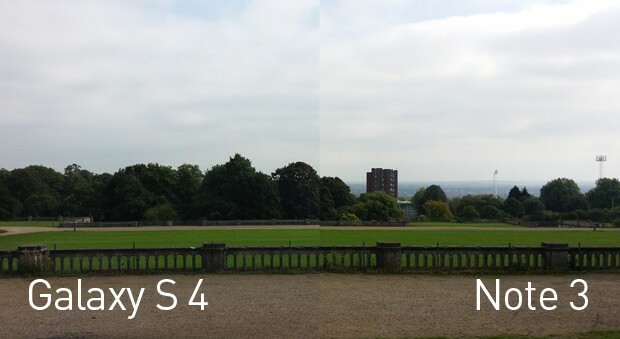 Anyone with previous experience of this mode on a stock Android device will tell you that it's very difficult to get seamless stitching of photos, and that different lighting conditions can make the final image look patchy. Sadly, that's still very much the case here. The only noticeable difference being that whereas the overlaps on pure Android seem to show harsh, straight lines, on the Note 3, there's some amount of fading / feathering to try to ease the transition. Either way, it still doesn't really work. What if you just want to take regular photos? You know, family events, sightseeing, nights out with friends and so on. In those cases, the Note's camera is a robust performer. Which doesn't surprise us much, as Samsung's track record in this area has generally been good. What's also been pretty consistent is the "handover" of features between the spring Galaxy S model, and the autumn Note. Given that the GS4 also has a 13-megapixel camera, a betting man would probably have been on safe ground if they were to put something down on the Note 3 having the same sensor. This is further bolstered by the equally pleasing results between the cameras on the two phones. The images we got with the Note 3 really do show what can be done with a phone camera, without the need for drum-banging, buzzwords and extreme pixel-count augmenting. Samsung hasn't thrown its hat into the high-pixel-sensor ring (yet), nor does it offer proprietary tricks like Sony's "Superior auto," or Nokia's OIS. Because of that, the detail captured is a touch less than that of its more photo-focused competition. But do they have S Pens? You make your choices. In good daylight, outdoor conditions the color balance, depth and detail all perform well. In less optimal conditions things were, well, less optimal. Those situations where there's a mixture of bright and dark subjects in the same photo (say, a room with a computer screen on) can cause problems for the sensor. Focus on the light part, and it can compensate a little too much, and darken everything else. It's less of a problem the other way around, thankfully. Similarly, shooting in generally dim conditions might first appear to give good shots when reviewed on the phone, but once uploaded, they can be prone to reasonable amounts of grain, and a touch of color washout. Overall though, definitely not above and beyond what is the norm for these conditions. If you're more of a movie kinda person, you'll likely be more interested in the Note 3's ability to shoot 4K video, and take 120 fps slow mo (with much less fanfare than Apple made with its 5s). Some of our astute readers will have realized that the display on the Note 3 is only HD, so how would one view this 4K footage? And that's a great question. The answer being, you can watch it back on the device, but if you want to see it in its full 3,840 x 2,160 glory, then you'll need to send it over to a capable player. Which, thanks to that USB 3.0 port discussed earlier, you can do in a jiffy. On a related note, when in video mode, you can watch the size of your file steadily grow (and remaining disk space decline) as you record. In 4K mode, it really does start to swell quite quickly -- not surprising given that it clocks in with a data rate of 48 Mbps (compared to the Note II's 17 Mbps for HD). Other options include an audio "zoom" feature that claims to enhance the audio of the framed subject when zoomed in. Our tests showed subtle differences, with voices sounding a little louder, but slightly more compressed (i.e., less dynamic in range, more crunchy sounding). In fact, the audio recording on video clips in general sound terrible when played on the device, with noise artifacts a constant annoyance. Played on the desktop, the sound is much clearer. Other ways to shoot lower-quality video include using the slow-mo modes. You can go right down to 1/8th speed, but be prepared to sacrifice a fair chunk of quality for the privilege. The Snapdragon 800 is one of the current darlings of the mobile processor world. 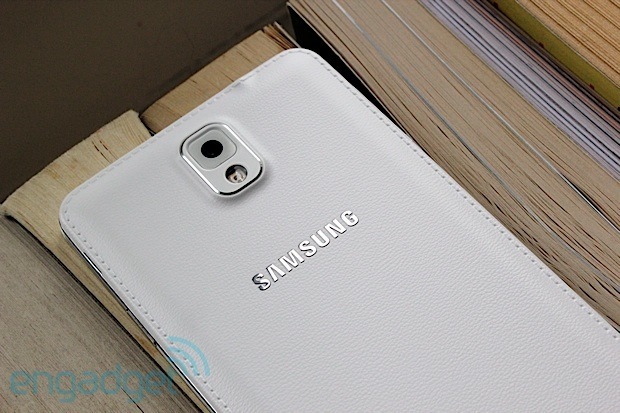 And the good news is that it's what's inside (this version of) the Note 3. The quad-core chip clocks in at a cool 2.3GHz, and with 3GB of RAM to play with (and the Note's family name to uphold) we're expecting big things. And that's pretty much what we got. Some of the benchmarks above demonstrate just how good it really is. If you're into the cold, hard numbers on performance, then the Note 3, and its Qualcomm heart, really doesn't disappoint. If we step out of the league tables, and back in front of the screen, then the performance still has to be applauded. Sometimes you know you've got a solidly performing device when after exhausting nearly every feature, multitasking it within an inch of its life and just generally giving its CPU some pressure, you never notice it flinching once. If anything, you get the sense that the Note 3 is casually sitting there filing its nails, while you try and get a reaction out of it. Long, media-filled webpages would fly past with silky grace; videos would play with nary a glitch while we multitasked (with the aforementioned webpage). As for gaming? Probably one of the slickest performers yet. During the review process, a number of different phones can be used to check features, options and do test comparisons. While using a Galaxy Nexus to compare Photo Sphere stitching, it suddenly felt old, almost sticky to use compared to the Note 3. Of course, it's a couple of years older, and if this is still your main phone, you might not feel that it's slow. But, much like going down from the Note 3 to a regular phone suddenly makes it feel "tiny," going back up to the Note -- performance-wise -- is a sensation akin to getting broadband for the first time after using dial-up. Even better news is that with a sizable 3,200mAh battery, you can enjoy all this smooth action for longer than you might think. Our good 'ol rundown test of looping an HD video with brightness set to medium, WiFi enabled (but not connected) and the usual social media and email accounts doing their thing gave a total time of nine hours and 36 minutes. Not bad for an LTE device with such a large screen to light up. The same is true for more general usage. The Note 3 will easily see you through over a day and a half's good solid usage (and we definitely put it to good use). These results seem a little less impressive considering the Note II's near 11 hours on the video test, and two days of general use, but we can attribute a part of that to the inclusion of LTE on this model. Either way, it's still a very solid performer on the power department. We briefly mentioned earlier how the speaker quality disappointed during video playback. In our opinion, it's actually one the Note 3's weakest features. We all know that playing music aloud on your phone in a public place is a crime against humanity, but with the Note 3, it'd be outright torture. We tested it side by side with the Galaxy S 4, playing the same music files, and the difference isn't just noticeable; it's night and day. The sound from a phone speaker is never going to be high-fidelity, but the Note 3 simply sounds cheap, brash and irritating to the ears. We're keen to remind you that this is only in relation to the internal speaker, which we'd hoped might actually be superior, given the potential space for a bigger driver. On headphones, the sound is much better, directly comparable with the GS4. Which is good, because the Note 3 can handle an exhaustive list of media formats, including all the usual suspects (MP3, WAV, M4A, AAC and FLAC), plus plenty more you might never encounter (though if you're a heavy XMF and IMY user, it's good to know you're covered). Movies are an obvious fit for a device of this size, and that display and processing power make watching them plenty enjoyable. The viewing angles and crisp image make it a delight to sit back and watch. Though, as we said, we would recommend headphones or a separate speaker. If your movie viewing should ever be interrupted by one of those old-fashioned phone calls, then you'll be able to hear the perpetrator clearly, and in our tests, we suffered no interference, noise or artifacts. If you prefer to enjoy your phone's media through a TV or AV setup, the DLNA and MHL options make this pretty easy, especially if you have a Samsung TV. AllShare makes starting a video on the handset, and then piping it over to your connected TV a cinch. MHL on the other hand is, of course, just a case of plugging it in to an HDMI port, something that Samsung has yet to make any more complicated than getting the right cable (and lucky for you, they're usually some of the easiest to find). Those of you more concerned with the network data side of things will be happy to know that the Note 3 drinks the bits just as fast as your network will provide them. Our time on O2's UK London LTE network regularly resulted in speeds of between 40-50 MB/s, which is about as fast as we've generally ever had regardless of handset. To get an idea what you might have to cough up if you decide the Note 3 is for you, Verizon will let you have one for $299 if you take up a new two-year contract; the price rises to $699 if you opt for month-to-month service. Sprint will be offering it for the same price, also with a 24-month contract. Britons can expect to pay around £620 SIM-free, or anything from free upwards on-contract. If you're looking for a larger phone, Sony's Xperia Z Ultra might be on your radar, and that's going to run you around $770 for the LTE version (pre-ordering from Negri electronics). 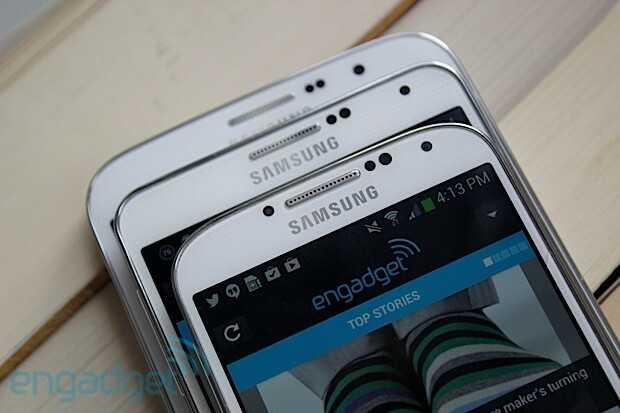 You could consider the Galaxy Mega, but the only real similarity there is size. Though if that's all that matters, then at $570, you might save a few dollars. With that in mind, there's a very good chance we might see some oversized hardware coming from HTC and Nokia in the very near future (perhaps within the month), so if you can hold off just a few more weeks, then this might change the landscape considerably. 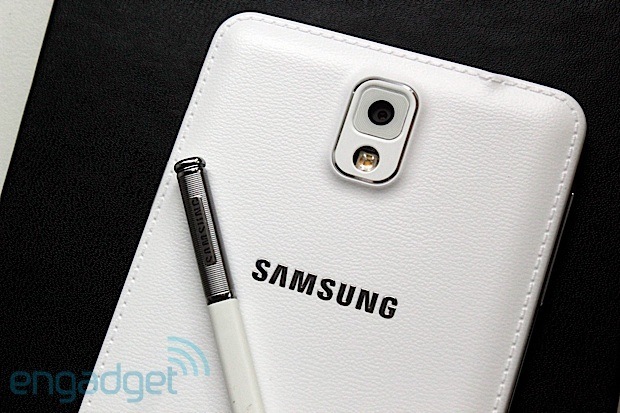 To use a term of phrase borrowed from that other mobile giant, this is Samsung's best Note yet. It's better in pretty much every way, with the possible exception of that speaker. The display is bigger, but it never makes the device feel inflated, which is some sort of dark magic in its own right. Either way, we applaud Samsung for consistently making this series better and better. But, like most good things, it does come at a price. In the UK, that price is going to be around £620 SIM-free. That's a chunk of change. Of course, it'll be much cheaper (and already, in some cases, free) on contract in the same market. US prices are set to be somewhere in between those two numbers, floating around the $300 mark. Not the cheapest phone, but those who have already converted to the way of the Note will likely see it as a necessary evil. If you're thinking about making the step up, we say get it while it's hot.